Q. Will the Democrats create an investigative committee modeled after the World War II Truman committee to explore waste, fraud and abuse and reform the vast government contracting system as they said they would? Q. If they do, will it be bi-partisan in nature? Q. Would such a committee be focused—this is not an "either or" question—on preventing problems in the future or on uncovering past abuses? Q. Why would such a committee be more successful than numerous past entities created by both the Legislative and Executive branches to reform contracting? Q. How would such a committee deal with jurisdictional overlaps with existing Congressional committees such as the Armed Services, Appropriations and Government Reform/Affairs committees, some of which are chaired by headstrong House members and Senators? Q. And what would be the scope of this committee? Speaker of the House Nancy Pelosi told reporters in December that Democrats will seek "a Truman Commission-like initiative to follow the contracting. The corruption in contracting in Iraq is staggering. It's breathtaking." While in the minority, Democrats on the House Appropriations Committee argued for a "Truman" investigative committee to root out waste, fraud and abuse in the tens, if not hundreds, of billions spent on Iraq and Katrina reconstruction contracts. The Truman Committee is considered one of Congress' most successful special investigative committees. From its creation in 1941 until 1948, when its mandate ended, the Truman Committee, named after then-Senator Harry S. Truman who first chaired it, held "432 hearings and 300 executive sessions, went on hundreds of fact-finding missions, and issued 51 reports," according to a Democratic report on the Committee Its work saved billions of taxpayer dollars and possibly also saved the lives of soldiers. It had a considerable positive impact on improving America's bang for the buck during World War II. Despite some rosy accounts, however, the Committee was not above entirely politics. President Franklin D. Roosevelt was not enthused with the idea of a Congressional committee investigating the Executive's handling of the war. During the Civil War, Congress created a Committee on the Conduct of the War which criticized the Lincoln administration’s tactics and strategy, interfering with his prosecution of the war. It "weakened Lincoln's control of his Administration throughout the war," wrote Donald H. Riddle in a book, The Truman Committee: A Study in Congressional Responsibility. A close ally of Roosevelt, Senator James F. Byrnes, held up Truman's resolution to create a Senate investigating committee. But when the much more firebrand Representative E. Eugene Cox threatened to create an investigating committee through the House, Byrnes moved the Truman Senate Resolution forward to thwart Cox. 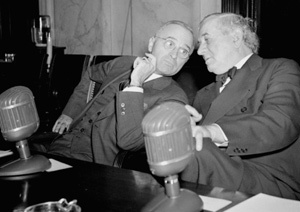 According to pollster Samuel Lubell who worked for Byrnes, Byrnes eased Roosevelt's fears of Cox-led investigations by telling him, "I can fix that by putting the investigation into friendly hands," referring to Truman. Though not immune from political maneuvers and pressure, Truman’s committee, created and run by a Democratic Congress, investigated activities taking place under a Democratic President while a world war engulfed almost every continent. And it operated in a bi-partisan fashion, by and large. Some of these, such as the effect on migration of labor, are not relevant today, but most are fundamental issues that a potential special Truman-style committee and the relevant standing committees should investigate. If Congress creates a special committee to investigate contracting in Iraq, Katrina reconstruction or other spending issues, that committee should take a look at investigations previously made by groups such as the Acquisition Advisory Panel (also known as the “1423 Panel”),which just completed its draft final report. A Truman-style committee, if properly designed and run, could assist in saving billions of taxpayer dollars. Perhaps it would finally tackle the black hole that is Pentagon spending—by far the largest slice of the federal government’s discretionary budget pie. The Center for Public Integrity found in a report that fully half of the Pentagon’s budget went to contractors. As was noted by Winslow Wheeler in an earlier piece on this Web site, trillions of dollars in Pentagon spending have been deemed unauditable. I don’t envy them, but a group of thoughtful, empowered people need to tackle the mess with our contracting system. I certainly do like the suggestion of naming this new committee, if such there is to be, The Truman Commission with all of the play on the respectability of the first commission that could be mustered. Human nature: harder to be a crook and/or liar if you're a member of a highly respected chosen smaller group of elected Representatives. America's eyes would be even more watchful. I cannot imagine recovering any funds mis-spent to this date or yanking any no-bid contracts. Just a beginning of a regularly meeting Commission, watched by national media, would seem to me to cause a sudden tightening of contractors' activities. Perhaps some intrepid reporter would start regularly asking why our troops are having their better built supplies sent to them by private groups from the concerned citizens of our U.S. Maybe another would even be moved to ask where the monies for the repair of vehicles and weapons has been spent. I sure hope I'm not disappointed in my hopes for this next two years. If this new House creates openess, can good reporters be far behind with their supportive questioning of our elected and appointed officials?